How can you be confident that your home school is based on proven standards and provides a solid Christian education? Whether you are a new or seasoned educator, or somewhere in between, Christian Liberty can provide you the materials and services necessary to be a successful homeschool family. It is our aim to minister to you in the great task of educating students in the fear and admonition of Christ. Our site not only outlines curriculum for each grade level but also provides a guide to evaluating the various subjects from a biblical worldview. It is our goal to provide you with the highest possible quality of Christ-centered educational materials and services at an affordable price. Please take time to discover how our resources can help you. Christian Liberty Academy School System (CLASS)—For those who are interested in obtaining academic services along with their educational materials, please consider the CLASS program. The full featured CLASS Plan offers standardized placement/achievement testing, individualized curriculum, alternate courses, grading services, report cards, diplomas, and transcripts. The Family Plan is more independent, offering all the same help with enrollment, but the family handles grading, report cards, diplomas, and transcripts. 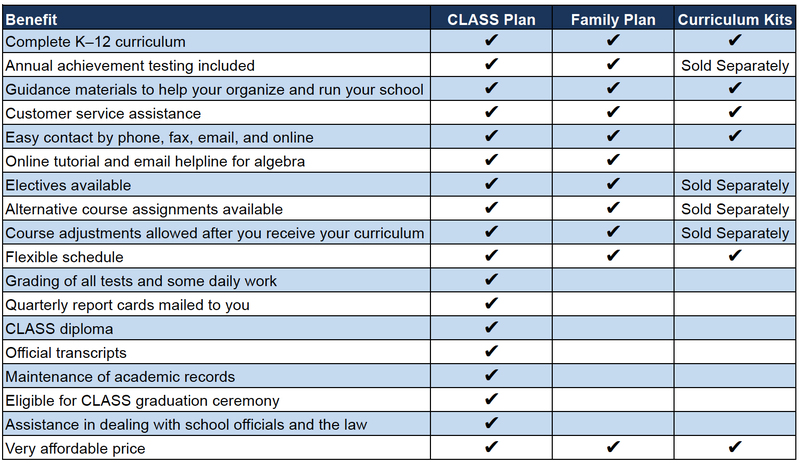 The table below illustrates some of the different features available in our CLASS Plan, Family Plan, and curriculum kits. Please visit the CLASS website for more information. Curriculum Kits—We have assembled curriculum kits for each grade level (Preschool–12). Each kit contains all of the materials you need at one low price, including tests and teacher materials. Most kits provide you with some choices when ordering; simply choose the texts that meet your needs. Please note that purchasing a curriculum kit does not enroll you in the CLASS program. The table below illustrates some of the different features available in our CLASS Plan, Family Plan and curriculum kits. Individual Book Purchases—You can shop by grade level, shop by subject, and even shop by publisher. You will find the educational products and support materials your children need or books for your own edification. Testing/Evaluation Services—To help you in the critical task of selecting appropriate materials for your child, Christian Liberty has developed specialized services for homeschoolers. We can test your child and provide a customized curriculum recommendation that is suited for your child’s skill level. If you are considering testing/evaluation, please check out our CLASS program, which includes this service at no additional charge. You have come to realize that it is your God-given responsibility to train up your children in the fear and admonition of the Lord (Eph. 6:4). You soon discover, however, that there is an overwhelming number of resources available. Today, the challenge is not to find a Christian curriculum but to judge the quality of what is available. How can you evaluate curriculum in the light of Scripture? There are many admirable qualities to seek in a curriculum—good organization, scholarship, interesting material, accuracy, etc. All these combined, however, do not result in a curriculum that is Christian. How can you discern what characterizes a curriculum or textbook as Christian? Christian curriculum should have the Bible as its foundation and standard. Curriculum must be built on a solid foundation. Only Scripture provides that foundation. It is the infallible rule for Christian education. Although the Bible is not the textbook in every subject, it should be used throughout. How is this to be done? First, actual texts of the Bible should be used appropriately in each course. This helps to reinforce that each subject is to be studied in the light of Scripture. Throughout, Scripture should be used as the standard by which to judge the opinions of men. It should not end there, however. The student should learn the great truths of Scripture and see how these provide the principles by which he should evaluate all things. In this way, he will learn to reason biblically and bring every thought captive to the obedience of Christ (2 Cor. 10:5). Christian curriculum should embody a consistent biblical worldview. Curriculum is not made Christian by merely adding Bible verses, talking about Christian topics, or teaching moral character. It must not be guided by a philosophy which is after the traditions of men (ancient, medieval, or modern) but after Christ, in whom are hidden all the treasures of wisdom and knowledge (Col. 2:8). The sacred Scriptures reveal the mind of Christ and provide us with a unique worldview. This biblical worldview must be clearly evident in the way subject material is taught. While there are many attempts to formulate a biblical worldview, the simplest approach is to follow the basic doctrines of Scripture. Textbooks and other materials should be shaped by the fundamental truths of Scripture. Doctrines such as the Trinity, creation, sin, redemption, etc., should direct the approach to every subject. These truths have been summarized in the Westminster Confession of Faith and Catechisms (1647). These embody the great teachings of the Protestant Reformation and are the tradition in which we stand. They render a unified and integrated system of truth which provides the framework for curriculum. Christian curriculum should have a God-centered unity. Because biblical truth is the criterion of Christian curriculum, each subject should be understood as a part of God's comprehensive view of the universe. A Christian curriculum will be characterized by a God-centered unity. Since there is only one God, and He reveals one unified system of truth in Scripture, Christian curriculum should be a coherent whole. God's truth must undergird and integrate the whole curriculum. Because God created the world, it reflects His order. As a result, all aspects of the world in which God has placed us should be taught in an organized and systematic fashion. Each part of this knowledge is interrelated. Furthermore, this unity should be conveyed from subject to subject and from grade to grade. A fragmented curriculum promotes a fragmented concept of reality and teaches the student that there is no one philosophy that accounts for everything. Christian curriculum should be Christ-centered. A God-centered curriculum implies that it should be Christ-centered. It must not be centered around the child, his needs, society, nor any other aspect of creation. While it must indeed minister to the child, it should seek to subject the whole child (spirit, mind, and will) to the whole Word of God, which focuses on Christ. Christian education means that Christ is central to the curriculum. Because of this, the gospel of Christ must be integrated into each textbook. It is by means of the gospel alone that the child will become a student of God. It is by faith alone that sound teaching will result in good behavior. Therefore, the gospel should neither be neglected nor simply added as a supplement to a secular presentation. Rather, the gospel claims of Christ must be woven, like a thread, into the very fabric of the curriculum. The goal of Christian curriculum should be to make disciples of Christ. True Christian education takes place when wisdom and maturity in Christ are attained. Its goal must not be simply to train children to be well-educated or prepared for a vocation, but to glorify God and enjoy Him forever. This means that they need to be taught not just reading, writing, and arithmetic in a neutral vacuum. Instead, each child must be encouraged to exercise faith in Christ so that he will read, write, and count for God's glory. In this way, education is part of fulfilling Christ's Great Commission. Teachers should employ a curriculum that helps them to nurture and instruct their students to be disciples of Christ. Curriculum is thus never an end in itself. Textbooks are important tools in teaching, but in the final analysis only God the Holy Spirit can make good materials effective. To that end, the teacher should pray and work that the student may be subject to God's authority. God is the primary teacher and we must depend upon Him to make teaching successful. Christian curriculum should incorporate sound Christian scholarship. Because God created every part of the universe according to His own wisdom, a Christian curriculum should seek to uncover the facts which He created and the laws which He ordained. God made us in His own image, and our minds should reflect His own wisdom and intelligence. Good Christian textbooks will therefore be characterized by a thorough study of all the relevant God-interpreted facts and pay close attention to how these are organized according to a biblical worldview. Christian curriculum should not follow secular models as the standard of what is best. It should not be led away by every wind of doctrine. Instead it should forge out a unique Christian approach through building on the achievements of sound Christian scholars. It must popularize and apply their insights into a biblical approach to each discipline that is academically sound. Christian curriculum should be presented in a manner that is interesting and appropriate for each grade level. To effectively train students, you must not only have sound content, but the presentation of that content must minister to each child as they grow to maturity. A course of study should be appropriate for the maturity level of each student. Materials should be suited for their level of understanding and should engage their interest. Nevertheless, it should not be judged merely by its enjoyment or entertainment value. Study is hard work, and students must learn the satisfaction of exercising their intellects to the glory of God. In the early grades, basics should be stressed. Students should concentrate on memorizing concrete facts, general information, and learning basic skills and the rudiments of God's truth. These common areas of study are necessary for every child to have in order to serve Christ effectively. In essence, these lay the foundation for further education. As students grow older, they should grow in godly wisdom and develop discernment from Scripture. They should be able to articulate a biblical worldview and defend it against false beliefs. They should become skilled in communicating God's truth to others. God has also endowed students with unique gifts. Teachers should help students identify and develop their gifts by specialized study and activity. Therefore, Christian Liberty Academy curriculum offers a number of elective courses and supplemental materials which you can use to minister to your students. While no perfect Christian curriculum exists, you should endeavor to obtain one which most effectively communicates the biblical worldview and helps you disciple your children to Christ. At Christian Liberty Press, we have sought to implement this by collecting, evaluating, and publishing materials which reflect this biblical worldview approach. Foundational to the Christian curriculum is the study of the Bible. Students need to be mastered by the Word of God before they can properly evaluate the writings of men. Bible study focuses the student's attention on the inspired text of the Bible. Its purpose is not the mere study of religion, nor even historical studies of Bible characters, but to arrive at a unified understanding of the biblical system of truth. In addition, the Christian student should be equipped to translate his knowledge of the Bible and its teachings into a philosophy that can challenge the wisdom of this world. Therefore, our curriculum includes training in a biblical worldview and apologetics. Our understanding of language begins with God's Word. The three persons of the Trinity have spoken to each other eternally. In the beginning God spoke and it came to pass. When God created man in His own image, He gave him the gift of language. Because God is the source of language, He must regulate its use. Christian education requires the student to study God's Word. To this end he must learn to read, and the best way to learn reading is to begin with phonics. Learning sounds of letters and letter combinations provides the key to pronunciation. Phonics develops the linguistic abilities that help students to glorify God. Skills in phonics are reinforced and developed through a good reading program. Since reading is basic to learning all other subjects, this program provides reading opportunities in a range of subjects. Such reading should help the child prepare to read God's Word and other textbooks. After the basic foundation is completed in phonics, grammatical skills must be developed as the foundation for writing and communicating well. The skill and art of writing is critical for students to express their thoughts clearly. Students need to learn how to use different kinds of sentences, to bring them logically together to form paragraphs, and to organize these paragraphs skillfully while developing stories and essays. They also need to learn how to spell correctly and choose the appropriate vocabulary. Writing, however, is never neutral. Therefore students must be taught to write and speak God's truth in love. Students need not only to master language but learn how to use it correctly. They need to learn how to communicate effectively for the glory of God. Christian curriculum should seek to acquaint students with the great literature which has helped shape Western Civilization. The study of such literature, however, must be judged by the greatest book ever written—the Bible. The student should be challenged to evaluate the words of human authors by the Word of truth. He should also be taught to distinguish Christian classics from the classics of unbelief. Priority should be given to the great classics which have either been written by Christians or reflect Christian values. Students should be encouraged to read these and become acquainted with good writing. This should both inspire them to live a life pleasing to God and help them write well. God is the Lord of history. History has not only been planned by God but proceeds according to His purpose. For this reason all history—ancient, medieval, and modern—must be viewed as the sovereign rule of God over the affairs of men. All men and nations are accountable to Him. The study of history warns students that God's curse falls upon unfaithfulness and His blessing rests upon faithfulness. A proper understanding of history is built around the key events of creation, man's fall into sin, the cross of Christ, and the return of Christ. Because of sin and grace, history is a conflict between the children of light and the children of darkness. Students should be equipped to study the vain attempts of apostate men to build the kingdom of man. But above all they should learn that history has one center and purpose. God's plan is to sum up all things in Christ (Eph. 1:10). Consequently its meaning and interpretation must be understood in terms of Christ. It is more than a chronicle of names, dates, places, and events. Its meaning is found in the redemptive work of Christ and how He is building His church. This is why church history and missions are an integral part of studying history. Our history program concentrates on the unfolding of world history with a special emphasis on the shaping of Europe and America. It seeks to trace the hand of God's providence in history as He used the efforts of Christians as they applied God's Word to their nations and cultures. Our biographies focus on the lives of key individuals who have contributed much to shaping history. The primary focus is upon great Christian leaders whose lives glorified God. The details found in these books will provide a more in-depth look at a particular historical period. They should also provide models for young people to imitate in regard to both their faith and their achievements. A biblical presentation of the social order is needed to address effectively the current corruption of society and show forth God's pattern for a godly society, government, and economy. The Bible and its laws provide the tools for evaluating the various social structures of different nations and peoples. The Old Testament reveals God's system of law for civil government. The student who learns this system has the proper criterion by which to critique human governments of the past and present. By using God's perfect law as the standard, political orders can be analyzed as to their structure, laws, and policies. God is the possessor of the earth, and the giver of all wealth. He owns it, and gives it to whomever He wills. He also ordained laws to govern economics. God has given men the right to own private property, the right to choose an occupation, the right to make a profit, and the right to decide how earnings should be spent. Scripture provides guidelines for how an economic system can glorify God and how people can show charity toward the needs of others. God is a God of order (1 Cor. 14:33). As students study His created universe they should see His marvelous numerical order. Students should be led to marvel at God's mathematical ingenuity. They should learn that it is not possible for them to understand creation without His gift of mathematics, for they would not have the tools for measuring His works. Mathematics is also a tool to help men rule over the earth under God. All callings in life demand planning, calculating, and evaluating in order to carry out one's responsibilities. Students should learn that math plays an important role in their lives. They should see how it is used in such areas as business, medicine, engineering, art, science, linguistics, and economics. They should master this wonderful gift to advance God's glory on earth. The study of science should focus on God's creation and not just critique evolution. By studying God's creation, students see God's awesome power, the beauty of His handiwork and the design reflected in every creature. After creation was brought into existence by God in six days, man was created to understand and subdue it for His glory. He is to cultivate, care for, and develop each aspect of the world. To subdue the earth as God commanded, the student must acquire an organized and systematic scientific knowledge. He must study the God-created facts of the world and understand how they are related by means of divinely ordained laws for creation. As students grow in their knowledge and appreciation of creation, they should learn to use this knowledge for the glory of God and the good of others. Scientific knowledge has always resulted in the development of new technology. Consequently, students should learn about its role in modern life, and how they may serve God through its proper use. The arts are gifts given by the Holy Spirit. Students should be taught to develop their artistic skills to reflect the glory of God, enrich life, and minister to others. These talents should be developed in harmony with God's truth. They should also study God's own creativity in nature and learn to imitate Him. Students should also learn how to evaluate the culture and works of art made by others. To do this, they must understand a Christian view of culture and art. The non-Christian uses culture as a way to revolt against God and glorify himself. In contrast, the student should understand that art should glorify God and be subject to His Word. It does not need to be religious in the narrow sense, but it should reflect a wholesome biblical worldview. Christian Liberty produces much of its own curriculum materials but we also carry products from other prominent educational publishers. We do so to provide families with a well-rounded curriculum that is cost-effective, academically sound, and presents a biblical worldview.